I settled in Bristol in 2011 after 23 years in Asia, of which 16 were in the Philippines, mostly working as an investigative journalist in the Euromoney group. 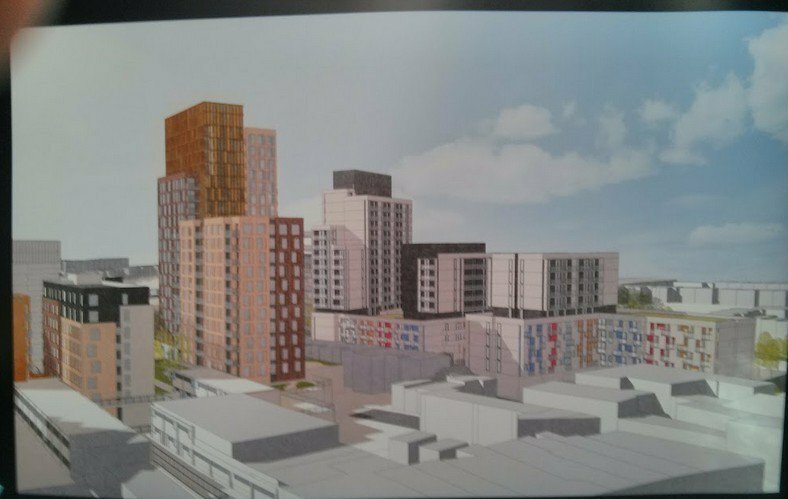 The Bristol Campaign Against Tower Blocks runs a Facebook group, which Councillor Nicola Beech, Cabinet Member for Spatial Planning and City Design, joined on Wednesday. “I’d like to welcome Councillor Nicola Beech, who joined the Bristol Campaign Against Tower Blocks Facebook group on Wednesday. “And while you are here, Councillor Beech, I would like to take the opportunity to ask you a question! “You’ll be aware that the world’s leading urbanists such as Peter Hall and Jan Gehl are agreed that mid-rise cities are healthier, easier to live in, solve the problem of creating low-cost housing better, and have built forms in which residents have lower depression rates. 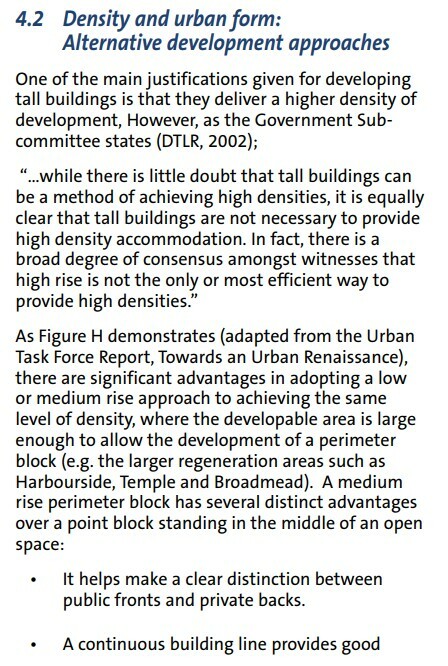 You’ll know that mid- or low-rise housing is preferred by the overwhelming majority of ordinary people. 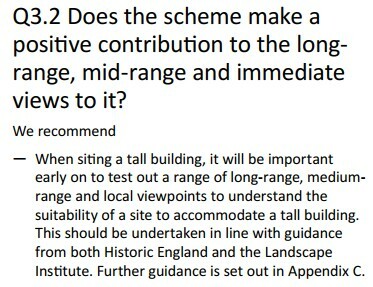 You’ll know that Bristolians voted 85% + against tall buildings in the consultation on the Supplementary Planning Document. “We are all, I believe, puzzled as to why you ignored the consultation survey results And why ignore the consensus of modern urbanists? Do you disagree with them, or have you just not read them? I am genuinely puzzled, I just don’t understand. We’ve heard no explanation except this phrase about tall buildings expressing ‘ambition and energy’. Where do these ideas come from? Could you help us understand your intellectual underpinnings? Unlikely of course. Because what is extraordinary about this episode is how a small group of people – Mayor Marvin Rees, and councillors Nicole Beech and Paul Smith – have imposed a new policy with devastating implications for the welfare, appearance, and future prosperity of the city without any discussion. The Mayor never appears in open forums, never faces unscripted questions from the public – except in safe, strictly local community groups, where he can be assured of smiling faces and a photo-opp. On the big questions, he dares not face the public. 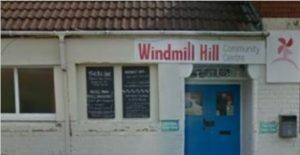 He has put out a set of statements justifying his behaviour, essentially saying that he does not need to consult or debate with the citizens of Bristol, because he was elected to take decisions. This is not how citizens of democratic countries expect to interact with their leaders. We expect openness and communication. We expect support to be gathered for policies by their being explained and discussed. On tall buildings this has not happened. At present debate on the issue is being overwhelmed by the Arena question. 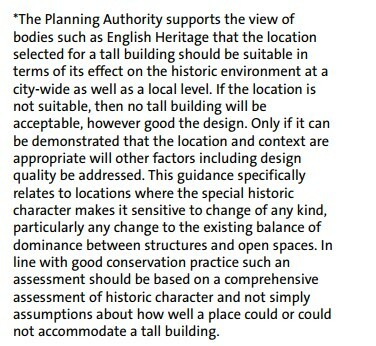 But in the long run tall buildings will have a more profound impact on our city. It is vital they should be debated. To an extent the Arena issue is an opportunity to raise another arguably even more important issue. 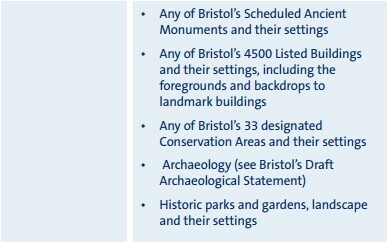 Many people are agnostic about the Arena but are absolutely horrified by the alternative plan, which epitomises the mayor’s desire to cover Bristol with high rises, against a popular consensus that these are not wanted (see evidence: http://bristolcommentary.uk/). 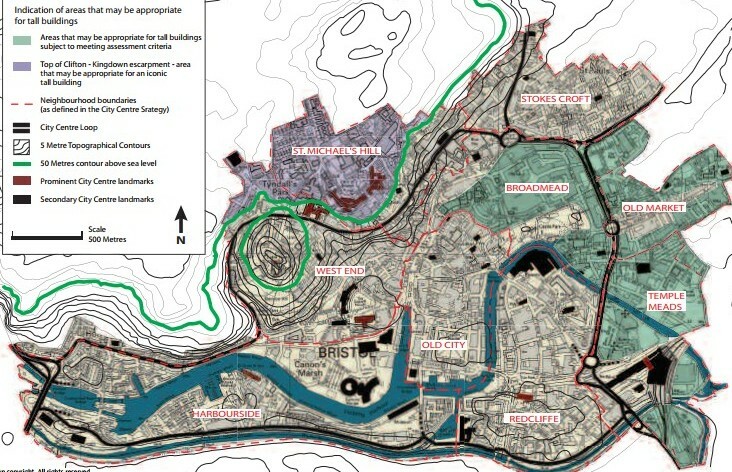 The arena issue highlights this threat – look at the horrifying plans! Marvin Rees appears to live in a sort of bubble, ignoring public opinion and making mistake after mistake. This is an administration where almost all decisions have to go through the mayor’s office, neighbourhood partnerships having been dismantled. People have no idea how to get themselves heard, and Bristol now has a real democratic deficit. Rees overrides the wishes of councillors, including most Labour councillors, creating great bitterness. He rarely appears in open public sessions outside his own geographical comfort zone. Consultations are arranged in focus group structure, making direct questioning of the responsible politician generally impossible. To push his high-rise policy he appointed as BCC head of planning Nicola Beech, formerly a long-standing PR in the consultancy JBP whose job was to lobby on behalf of residential developers, who has aggressively promoted to developers the message that George Ferguson’s time is over and that high rises are now ‘in’. The result has been a torrent of high rise proposals. However as almost any planner will tell you, there is an inverse correlation between high rises and providing affordable housing. 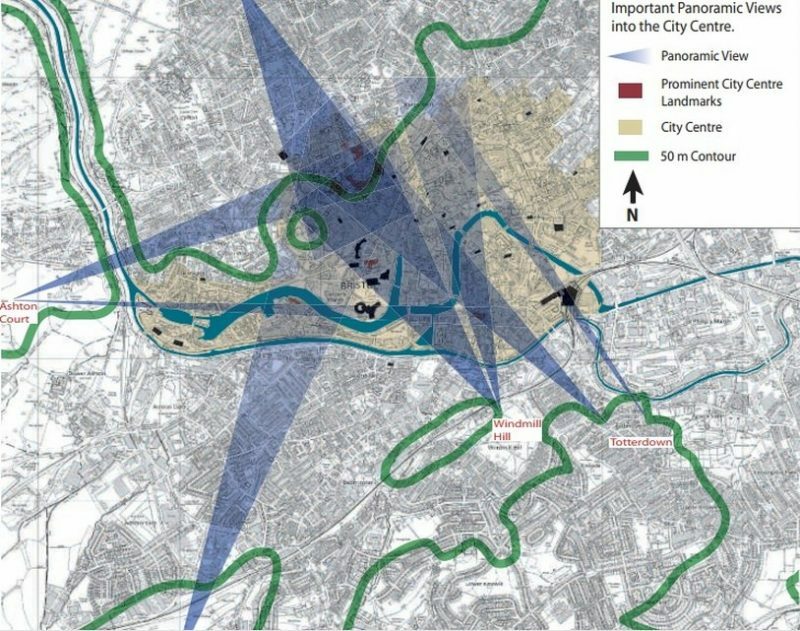 The new policy will have a disastrous impact on Bristol’s skyline and on Bristol’s long-term economic future, because it will harm its Unique Selling Point – its beauty, charm, and pleasant environment. You only have to look at the new plans for Temple Island to get the point. I would be delighted to talk to you about these problems along with other citizens who are in despair at the way the city is being led, and the horrendous transformation we are living through. Three months ago, by a stunning majority, Bristolians rejected their Mayor’s call to “show ambition and energy” by populating their city centre with tower blocks. 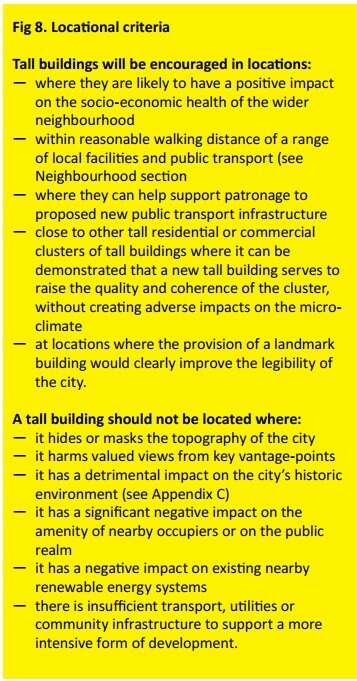 The statutory consultation on tall buildings in Bristol, which lasted from 26 Feb – 12 April, received more responses than any previous Bristol consultation on any other subject ever – 665 responses. Because of our strong suspicion that Mayor will ignore the results – his second annual address said tall buildings is still policy – here’s a brief reminder of the clear and overwhelming results of the consultation on the draft Urban Living Supplementary Planning Document (SPD). Respondents were asked 9 questions. Here are the major points. The idea that new buildings should be allowed to be significantly higher than those round them is rejected by 82.01% of respondents. 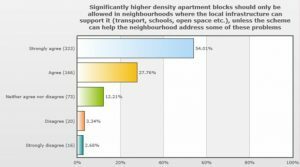 Support for high density developments is specially low in contexts where transport, schools and open space infrastructure were likely to be insufficient. Then, only 6% supported higher density blocks. 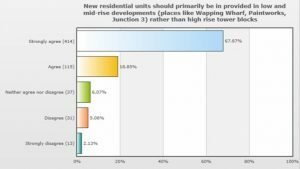 Respondents strongly prefer that new residential units should be provided in low or mid-rise residential developments (87%), as opposed to high rises (7%). However our respondents are not extremists. 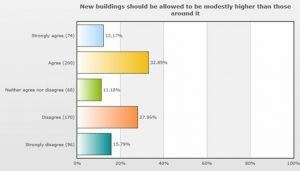 They agree that new buildings should be allowed to be modestly higher than those around them (45.06% for, 43.75 against). 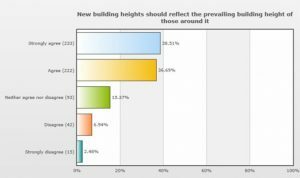 But they feel that in general, new buildings should reflect the prevailing heights of those around them (only 9.42% disagree). One can speculate the extraordinarily strong response was partly prompted by the very aggressive positioning in favour of tall buildings by the Mayor after the 2016 mayoral election (given that the issue had not been raised in his 2016 manifesto, and not subsequently consulted on except to 2 groups consisting 85% of building industry professionals). 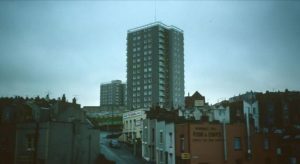 Bristolians suddenly faced the prospect, with absolutely no warning, of their city being rebuilt with a morass of ill-considered high-rises in the centre foisted on them by a strongly free-market Labour administration, with close links to developers. 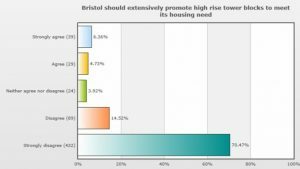 Densification, Bristolians agree, is necessary to make their city more afforable, more liveable, more walkable, more sustainable, healthier, better at promoting residents’ happiness, and more vibrant. They support a minimum density of 50dph and a maximum of 200-250dph in central areas. They support densification near transport hubs, and they support redeveloping low density industrial areas, particularly to the east of the city. But they refuse to believe that these aims require high rises. “Concerns about the social, health and wellbeing impacts of living in tall buildings, with respondents citing research indicating a number of negative eﬀects including: increased levels of stress and mental health issues, aﬀecting both adults and children, poor social outcomes (even when socioeconomic conditons are comparable), increased crime and fear of crime. 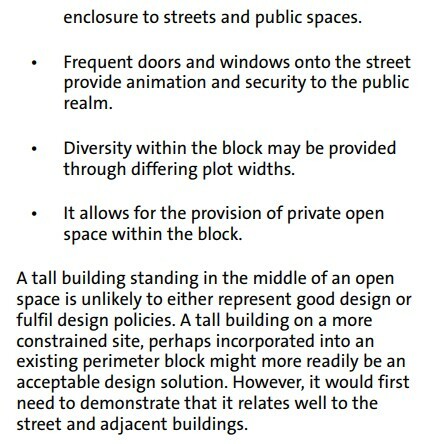 “General concerns about the function and liveability of tall buildings such as the provision of private space and access to communal space. “Expense of building tall makes them less likely to deliver aﬀordable homes and so fails to deliver mixed and balanced communities. 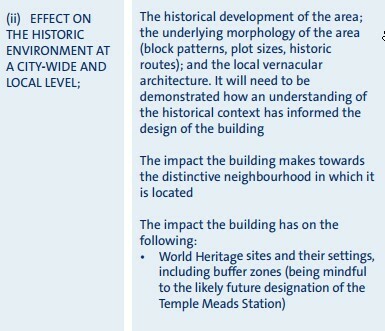 “Concern over impact of tall buildings on both local context, but also city wide character in relation to the city’s unique topography. 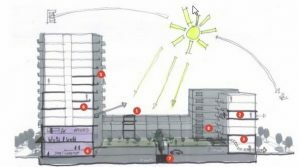 “Scatter gun” approach to location of tall buildings strongly resisted, with many citing the existing SPD1 as providing more appropriate guidance on tall buildings. 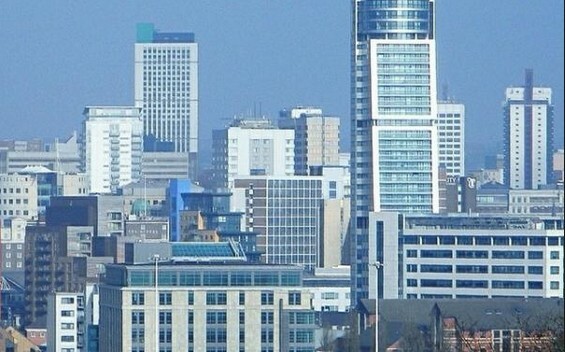 “The statement in the Mayor’s forward (‘I want Bristol’s skyline to grow etc.’) must be seriously challenged. Given the unique topography and character of our city the two positions he advocates are irreconcilable: The promotion of tall buildings will lead to a permanent change in the scale, appearance and character of the city. 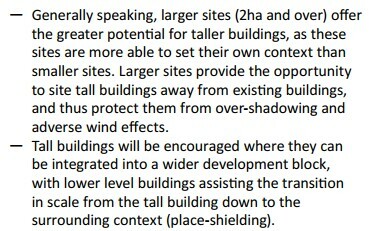 Since it is essentially irrelevant to the provision of housing it should be with in a separate update to SPD1; Tall Buildings, dealing with all building types. 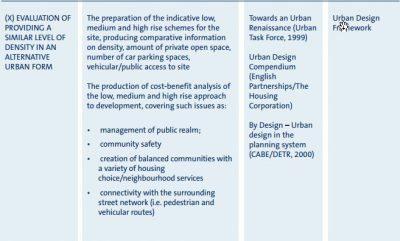 “[The draft SPD] Lacks a vision statement/nontechnical summary; there is scope for setting out an inspirational vision for living at high density that matches Freiburg,Vauban, Accordia Cambridge or Cambridge Clay Farm etc. This is an extraordinary result. This is a decade in which the high-rise horrors of the 60s appear to have largely been forgotten elsewhere in the UK. 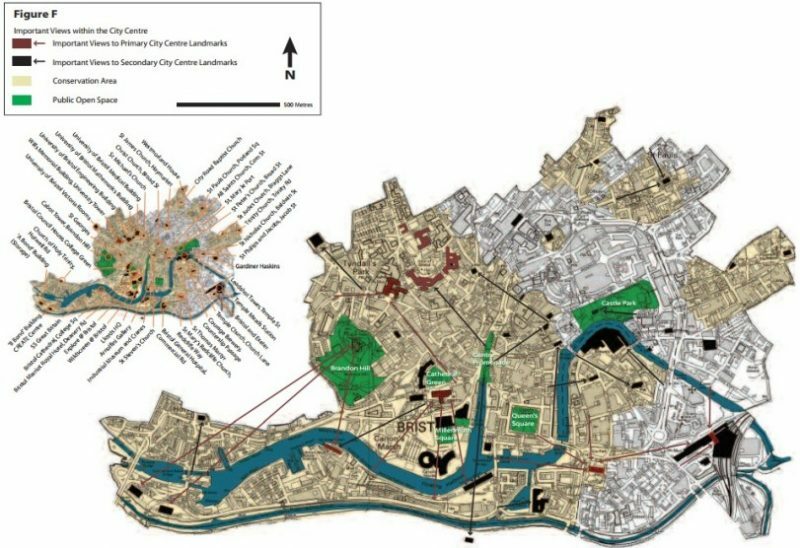 In London 510 buildings over 20 floors are planned (according to a 2017 survey), with only a few boroughs like Kensington and Chelsea and Richmond free of tall buildings proposals. Yet Bristol is resisting the vision of “modernity” symbolised by shiny towers. Instead it favours the more sophisticated urbanist vision of the Happy City widely current in continental cities. This urbanist vision has been embraced by cities like Munich, Lyons, Toulouse, Freiburg, Amsterdam, Copenhagen, Montpelier, Vienna and many others but is little known in Britain, as lamented by our greatest urbanist Peter Hall in his last book Good Cities Better Lives: How Europe Discovered the Lost Art of Urbanism (2013). However Bristol, showing its distinctiveness, its quirky, progressive, and forward-looking character, has responded to higher ideals of city living than the Mayor’s “me-too” desire to copy the dull models of Leeds, Cardiff, and Birmingham. 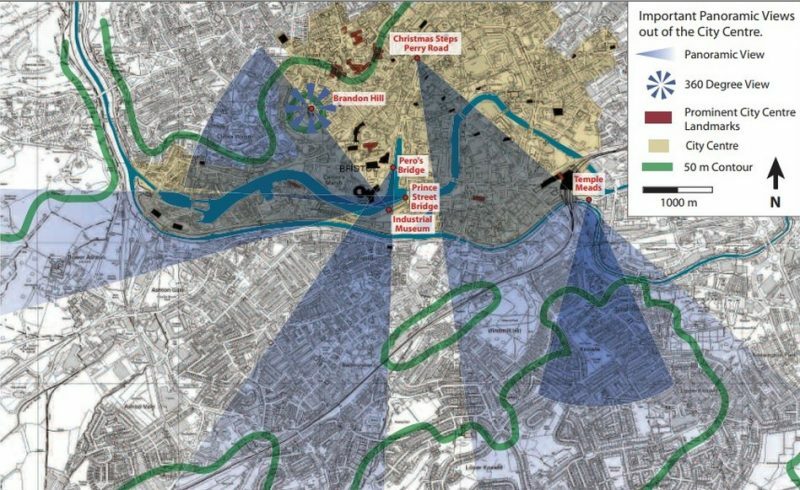 Bristol wants an inspirational vision – but the Mayor has not provided it.